In 1942, Ronald Colman played a character so shell shocked by the trenches of World War I that he walked out of the hospital where he was recovering, having no idea who he was. He was taken in by a singer in a vaudeville house (Greer Garson), fell in love and the two married. Then years later, he suddenly, out of nowhere, remembered who he really was, but totally forget that his wife existed. He discovers he’s the scion of a wealthy family and eventually runs for political office, not knowing that his secretary is actually his wife. This movie is Random Harvest and is perhaps the most romantic and delirious use of amnesia in film. But amnesia has always been a useful tool of storytelling, whether romantic (here and in Law of Desire) or in thrillers (Mr. Budwing and Mirage) or comedy (The Hangover and 50 First Dates). Coming Home, written by Jingzhi Zou and directed by Yimou Zhang, falls into the more melodramatic end of the spectrum like Random Harvest. It’s unabashedly sentimental and relishes in a sort of 1930’s studio romanticism tone and style, though the grittiness makes it more Warner Brothers than MGM. Surprisingly (or perhaps not, since China is still thawing when it comes to cultural freedom), it’s not particularly political. It has a political background most certainly and is set against a not particularly proud time period of recent Chinese history. But the basic plot and resolution is something that could happen in any location in any era. At the same time, by setting it against the final years of the Cultural Revolution, even without making that what the movie is bout, the filmmakers have their cake and eat it too. 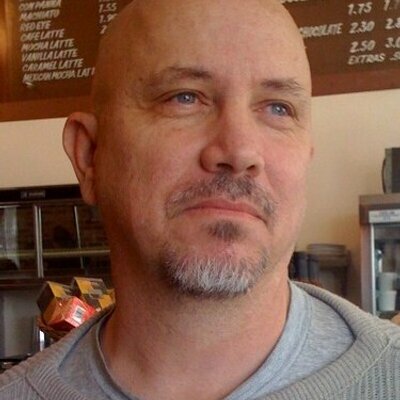 They can criticize Chinese authority while never really directly blaming them for the sad events in the film. The story basically revolves around Wanyu (Li Gong) and Yanshi (Daoming Chen), husband and wife who have a teenage daughter Dan Dan (Huiwen Zhang). Yanshi is in a labor camp for actions against the government. But one day he escapes and the authorities assume he is heading home and warn mother and daughter to turn him in if he shows up. Complicating matters, at least for Dan Dan, is that she is up for a major role in the ballet Red Detachment of Woman (which, every time I see segments from it, seems the high point of camp). Yanshi is caught and returned to prison. But in trying to help her husband, Wanyu falls and hits her head and develops selective amnesia. When her husband returns home, she no longer recognizes him. The movie dramatizes Yanshi and Dan Dan’s attempts to get her to remember. I think that one could make a case that the movie is something of a slight letdown in that it begins as a political thriller deeply critical of the Chinese government and then ends up a romantic melodrama. I’m not sure the two halves fully work together as strong as one might want. It’s like a movie starting out as I Am a Fugitive From a Chain Game and ending up as Back Street. 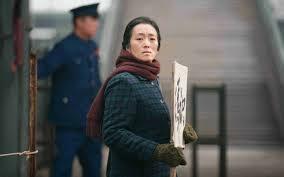 But still, Coming Home is a lovely and ultimately moving film with strong and empathetic performances by all involved. Li Gong has been in a huge number of Zhang films from his earliest success Red Sorghum to, most recently, The Curse of the Golden Flower. Here she again contributes another of her memorable performances in a heartbreaking role. The movie doesn’t end as expected. It does seem to say that love conquers all, but not remotely in the way you think it will. The last shot of the movie is one that certainly stays with one. At the same time, I’m not sure whether to cry at the semi-tragedy or be uplifted at the human soul triumphing. Either way, it’s very poignant. 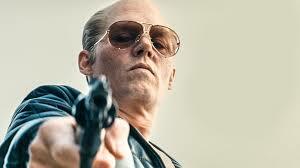 Black Mass, the new Johnny Depp starrer, is an odd duck of a gangster movie. As written by Mark Mallouk (a first feature) and Jez Butterworth (who has worked on such entertaining fare as Edge of Tomorrow and the upcoming SPECTRE), and directed by Scott Cooper (who has shown an affinity for gritty stories like this when he helmed Out of the Furnace and Crazy Heart), the film is never boring. At the same time, it’s not particularly interesting either. 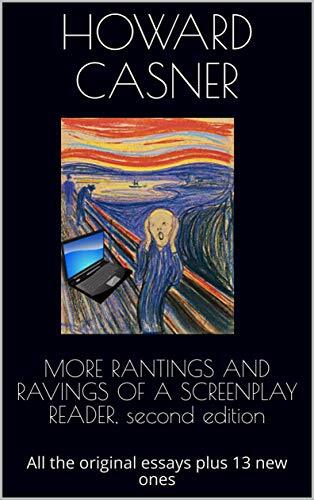 One would think it would be hard to make a film on this subject that is little more than okay. But in the end, Black Mass, in spite of some good points, is a fairly routine crime biopic that never seems much more interested than in filling in the details of what happened. I’m not sure it has anything to really say about the situation other than what is on the screen. It’s sort of a what you see is what you get movie and those involved never can really get it to rise above what it is. The movie is rich in technical detail, though, with strong and authentic art decoration and costume design. And the cinematography gives everything a patina of gloom as if it’s always going to rain any moment. Johnny Depp plays Bulger with a widow’s peak and dead eyes. In many ways, this is a perfect role for the actor who likes to do whatever he can not to look or act like himself on the screen. Here he can portray a very extreme character type without playing a cartoon. And in many ways, he’s very good. At the same time, I had a very odd reaction to his performance. Like the movie, again strangely enough, the character is really not very interesting (he’s pretty much your garden variety socio/psychopath) and Depp didn’t seem to be able to do that much with him except play the part as written. So in the end, I never really reacted to him as if he was giving a good performance. What I kept thinking is that it does prove he can be very, very good in the right role if he is provided with one, but that there’s only so much he can do here. 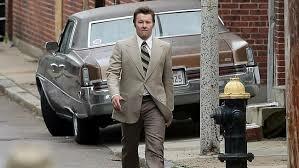 The real standout in the movie is Joel Edgerton as John Connolly, a childhood friend of Bulger’s who joins the FBI and tries to use Bulger to promote his own career in the Bureau, but instead, ends up being used by him. It’s a great sweaty performance, his eyes constantly darting from egomania to panic to paranoia. He even gets you feeling sorry for him at times as you have to continuously remind yourself that he has only himself to blame for the way he screwed up his life. The cast is filled out with some of the greatest character faces I’ve seen in film in some time: Jesse Plemons (from Breaking Bad); Rory Cochrane; and W. Earl Brown as Bulger’s cohorts. All feel as if they grew up on the mean streets of Bean Town with their lives carved into their faces. Also on hand is Benedict Cumberbatch as Bulger’s brother (who never seems comfortable with his Boston accent) and Kevin Bacon, David Harbour, Adam Scott and Corey Stoll as Connolly’s colleagues at the FBI. They all give satisfying performances, but also feel as if they are no more than along for the ride. Perhaps most notable here is Peter Sarsgaard in a nice bit as Miami thug Brian Halloran who out-psychos Bulger and out-sweats Connolly.